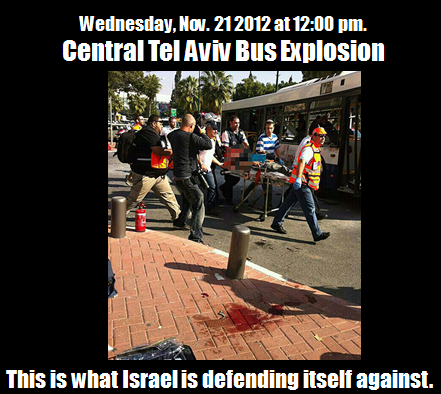 The last 7 days in Israel have been hell on earth. 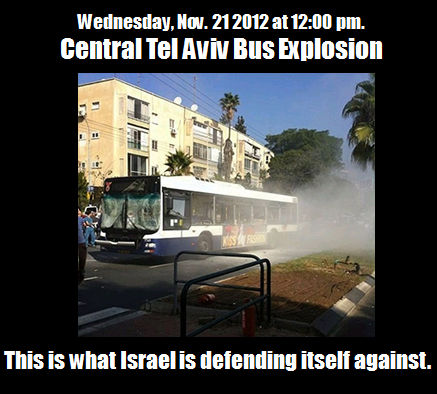 Today around 12 PM a massive explosion was heard in the streets of Tel Aviv, my city. explosive charge was placed on a bus and exploded after the terrorist managed to escape. Yes, Dozens of people are killed in Gaza as well. It’s true. It doesn’t mean that me, my family, my friends and my neighbors are now free to be murdered. Not a person in the world could or should live like this. World, help us – STOP THE TERROR!